Heavy-duty carbon steel construction with a FDA White epoxy finish. 304 stainless steel material contact surfaces with continuous welds ground and polished smooth. Easy-Load™ rotary bag hanger system for rapid bag connection. Loop-Lok™ powered strap release system. Power-Lift™ powered fill head height adjustment system with 48” of travel. Powered roller conveyor in filler base. High output bulk bag densification system for stable filled bulk bags. 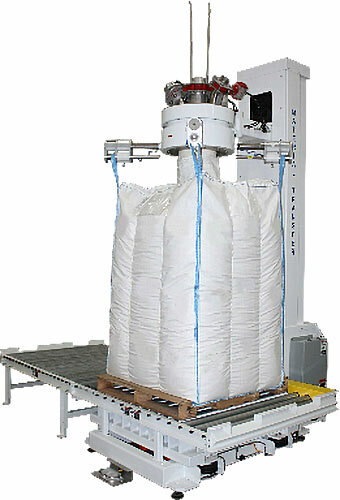 Bag inflation system quickly removes folds and creases in the bulk bag before filling for maximum fill volume. Inflatable USDA/FDA approved spout seal creates a dust-tight connection to the bulk bag fill spout. Dust take-off stub with actuated butterfly valve. Includes flexible inlet connection with flexible hose guide system. NTEP approved weigh modules and a signal converter with 4-20ma output module.